Campers receive instruction and compete in a broad range of sports, including, basketball, softball, volleyball, soccer, rugby, football, lacrosse, ultimate frisbee and much more. Campers also compete with neighboring summer camp and local town sports teams. 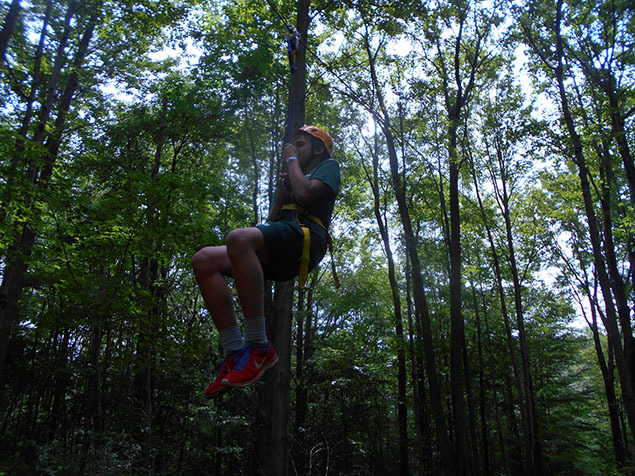 Campers enjoy a variety of adventure activities overseen by qualified and trained staff, including navigating a challenging ropes course, climbing wall tower and zip line. Campers use LDBC’s Olympic size swimming pool for free swims, swimming lessons, diving, water polo and swim meets. Campers also have the opportunity to learn to use canoes and kayaks in beautiful Lake Delaware, the camp’s private lake. Each Sunday campers march in the parade field to show off the results of their weekly practice. LDBC’s renowned precision drill team (the “Crack Platoon”) and Drum and Bugle Corp perform during each parade and at Community Days in neighboring towns. Set amongst mountains, forest, streams and beaver ponds, campers experience nature up close and personal. Campers can participate in hikes, overnight camping trips and fishing. LDBC offers a full and varied arts and crafts program. Campers have the opportunity to sing in the renowned LDBC Choir, which has performed at Lincoln Center in NYC, or the LDBC marching band. Campers enjoy a variety of new and different theme days each summer, including such theme days as the LDBC Olympics, Super Heroes Day, Harry Potter Day and Scotland Day (presented by our Scottish counselors).